It was the same pleasant weather in Bangalore; something we’ve always enjoyed everytime we stepped foot in the city. The entire team had grouped a day before the event in the Bangalore office to go through the meet agenda. But like every blogger meet we usually end up forgetting the agenda; so leaves us thinking why we have these brainstorming sessions. And we don’t even need an excuse to drink actually! The meet was a culmination of more than a month of hardwork by all the stake holders prior to the meet. The video showcased at the meet was shot by Anoop; which was not just well received but received a lot of mentions on twitter as well. 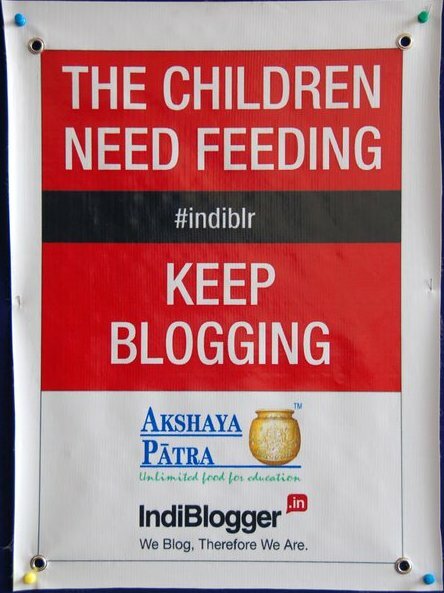 IndiBus made a roaring debut with more than 60 bloggers using it to reach the venue and back. Many bloggers liked the fact that they could meet and talk blogs much before the meet and get to know each other better. The super fast ultra mega deluxe blogger meet luxury express was however late by an hour for the blogger meet thanks to super-fast traffic in Bangalore on the Sunday afternoon. Akshaya Patra after hosting a very successful contest on IndiBlogger where each blog post fed 50 children made a grand entry into the hearts of the blogosphere with a MASSIVE blogger meet aimed to improving awareness about the noble efforts of the NGO and the lakhs of children who are given nourishing food every day. The success of this endeavour cannot be emphasised enough; because when they started back in June 2000 they were feeling close to 1500 children. Now they are feeling more than 1.2 million children daily making them the world’s largest NGO to implement the mid-day meal programme. The meet had more than 270 registrations with bloggers from all over the country coming down to Bangalore to meet and network. The meet had bloggers from all walks of life – from homemakers, software engineers, government officials, entrepreneurs to even school students. Based on suggestions from Lakshmi Rajan, we changed the format of the blogger introductions which went off very smoothly thanks to the system built especially for Blogger Meets. 60 random bloggers were chosen and had 30 seconds to introduce themselves. The screen also showed their blog link for others to see and refer. The bloggers who took more than 30 seconds to introduce themselves were ceremoniously sent to jail. All bloggers who introduced themselves got a photobook specially printed for bloggers by the bloggers. The photographs were taken by Naveen and Sanjeeb. Next up was the lunch served which was also the same food that children eat everyday. There was bise bela bath and sweet pongal served with some namkeen. Bloggers got to experience for themselves the quality and nutrition value of the food served. The time tested activity of Live and Let comment then commenced. A few first timers also asked what the chart papers were for and we were only too happy to respond, “You shall soon find out!” Soon the bloggers were seen sketching some funny stuff on everyone’s back. Some were risqué too! Rashmi from IndiBlogger was even proposed to by two bloggers. Why they would want to marry the crazy sketch pen lady of course is a discussion that warrants an #IndiTweetMeet ASAP! This was followed with a discussion by Akshaya Patra who shared their journey as an organization that is doing social good. A lot of bloggers also shared suggestions for incorporation into their activities. The good thing about the session was that it was yet again proven that the blogging community is always there to support noble causes and would welcome any initiative with open arms. Bloggers also emphasised that they would like to have a long term association with them. The final session included group discussions moderated by bloggers themselves. Issues ranging from online harassment to technology were discussed by them; and some even taking notes on their iPads and tablets. This was followed with a team introduction; as usual the person introducing others forgot to introduce himself. This time the victim was Renie, but he really needs no introduction. He is the guy with the porcupine hair; we all know that now don’t we? After another successful blogger meet in Bangalore, the team headed to The Higher Taste, an exclusive restaurant in the ISKCON premises where vegetarian gourmet food is served. Some patrons of the restaurant later complained about the empty buffet counters. We thank Bangalore bloggers for being as hospitable as ever and Akshaya Patra for the wonderful work they are doing making every blogger in India proud to be associated with them. The blogging community is indeed committed to bringing social change in India! Welcome to Indiblogger product blog on Face book.It is hoped that now we need not search for blogger meet related news/posts on indivine or Forum. Next story Back to Kolkata – this time, it’s for the children!